I tend to hop from one craft project to another, from blankets to amigurumi but also from crochet to sewing to polymer clay. Maybe I am not really focussed for that matter, but it does keep me enthusiastic and thus motivated. It gives some variation and sometimes you can even combine crafts (for example my cupcake keychain I combined crochet with a polymer clay ice cream cone and some ribbon). I made the background in photoshop and my inspiration came (of course) from the beach. In the top of the image you can see a baby and her mommy jellyfish (which I hate in real life, but like this they are rather cute), in the bottom an octopus and a hermit crab. I painted faces on them with acrylic paint after baking and glazed them when the paint was dry. I use the brand FIMO clay, another well-known polymer clay brand is Sculpey but it is not offered in my local stores. It should be simular though. Has anyone worked with polymer clay before? Oh by the way, in the image you see "by Suzannetje87" this is my username on DeviantART. A website for all kinds of crafsts (a bit like Ravelry). So if you are a member there you can find me :-). These are awesome Suzanne! 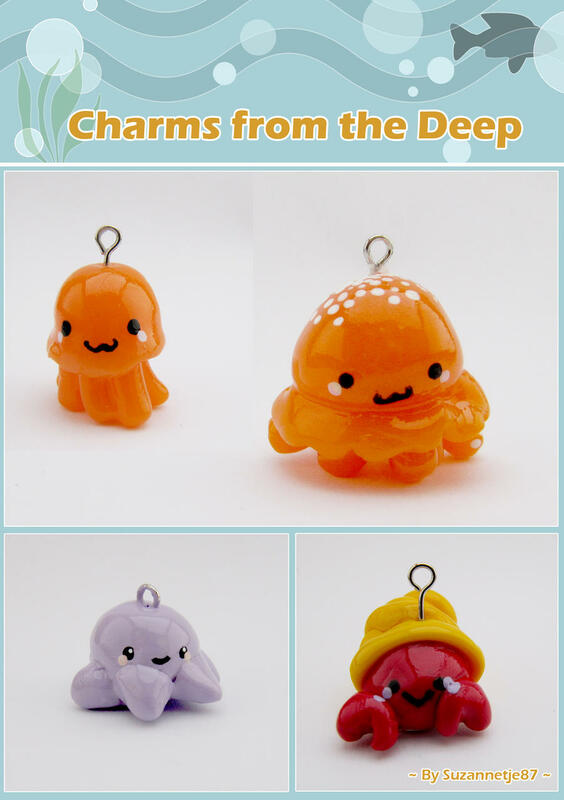 The mummy jellyfish is my favourite one I think as its very orange and spotty!! You are so talented, being able to make so many different things!! I haven't played with fimo since I was a kid, but a fellow blogger was talking about it the other day and I can so remember the smell of it when it came out of the oven....yum! I must try it again sometime, your little charms are lovely! Thanks you Hazel, that's so sweet but I think you are just as talented and crafty as I am!! @Faith, the smell...yes it indeed brought back some memories when I opened the oven for the first time. Ooooh, I love the smell of fimo in the morning. I too havent played with fimo since I was a kid, you have inspired me to get some and play some more- this time with my kids! Im loving the hermit crab!